I read the novel when it first came out because the title intrigued me, and I found it quite good. 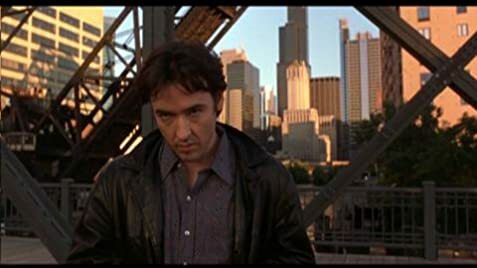 When I heard John Cusack was adapting it and moving the action to Chicago(from London in the novel), I was a little worried, because I worry about changing things during adaptations for arbitrary reasons, but I needn't have worried; though I have a few quibbles, which we'll get to later, Cusack and Co. have done a fine job adapting the novel. First off, I've read one comment which claims it stereotypes "music geeks." The type of people Hornby, Cusack, his co-writers(D.V. DeVincentis and Steve Pink, who also co-wrote GROSSE POINT BLANK, and Scott Rosenberg), and director Stephen Frears are portraying is a very particular type of "music geek"; the type who is a snob about music. Almost all of us, I would say, are aggressive about our likes and dislikes when it comes to music, but not many, I agree, compare liking Marvin Gaye and Art Garfunkel to "agreeing with both the Israelis and the Palestinians." And probably not many of us would be so cut off from feelings that, when hearing about a person's death, would find no better way of expressing their sorrow than listing their top 5 songs about death. Yet we do like these people as characters because we see even if they have some snotty attitudes, they do have a genuine love for their music, and they're in a low-paying job because they love what they do. And who among us hasn't turned to music when we've felt sad(or happy), like Rob does, or wished that Bruce Springsteen(and a pox on the person who, in their comments, implied he was passe. Bruce will NEVER be passe) would talk to us directly like he talks to us through his music? The novel and the movie captures all of that. Another strength, of course, is Cusack's performance. Woody Allen once said that while American actors were very good at playing virile men of action, there weren't many who could play more "normal," regular people. Cusack, on the other hand, has carved out a niche for himself playing regular guys. He doesn't look like The Boy Next Door, and he's neither stereotypically sensitive or hip, but comes across as a guy who feels both at ease and yet still longs for something more. At his best, like in movies such as THE SURE THING, SAY ANYTHING, THE GRIFTERS, BULLETS OVER BROADWAY, GROSSE POINT BLANK, and this, he plays people on the cusp of growing up, who are able to if they want to, but aren't sure if they want to, and yet he's made each of them different. 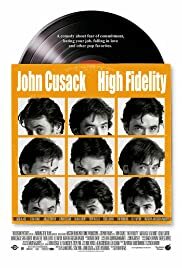 Rob's condition may be a little more conventional - he's not sure if he wants to settle down yet - but Cusack, while unafraid to show his unlikable qualities, makes us like Rob anyway. The rest of the cast is also quite good. The well-known names only get short takes(Lisa Bonet, Joan Cusack, Tim Robbins, Lili Taylor, Catherine Zeta-Jones), but they make the most of their time. I've never seen Iben Hjejle before(I haven't seen MIFUNE), but she does well as the most grown-up person in the movie. But the real stars, besides Cusack and the music, are Jack Black and Todd Louiso as Rob's co-workers. Black especially reminds me of people I knew. As I said, I do have some quibbles. There are a couple of incidents in the book which don't make it to the film which I would have liked to see(the Sid James Experience, and the lady who wanted to sell Rob a ton of valuable records for a ridiculously low price). I'm getting tired of movies which use rain as an expression of sorrow, and this is an example of overuse. And the character of Laura isn't developed as well in the movie as she was in the novel. Nevertheless, this is well worth checking out.